Enjoy a tropical beach vacation in Santa Teresa, Costa Rica in your own private paradise at Los Almendros Beach Bungalows. Quiet, charming and secluded, this nature getaway fronts some of the best surf in renowned Playa Santa Teresa. You are steps from the beach walking a short, shady garden path. Los Almendros has two elegantly rustic beach bungalows outfitted with all the amenities you need for a blissful beach getaway. Los Almendros Beach Bungalow #1 accommodates three persons with a king bed and a trundle twin bed. Los Almendros Beach Bungalow #2 is ideal for couples with one king bed, a mini-refrigerator and a smoothie-maker. Both comfortable Santa Teresa vacation home rentals feature air-conditioning, private bathrooms with walled outdoor garden showers, and personal decks. 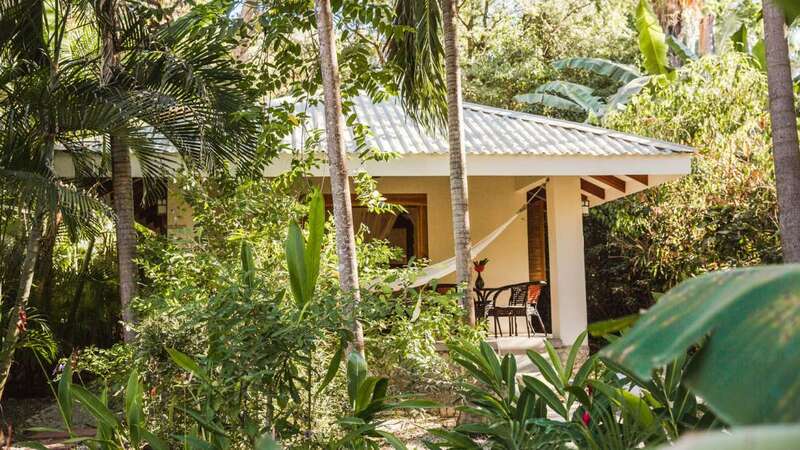 The two bungalows share a common open-air kitchen area and the incredibly large garden property where tropical birds sing in the trees. Relax in hammocks hung from palm trees throughout the property. You are close to the area’s most popular sights and local hotspots, and some of the best Santa Teresa restaurants are a short walk away. If you want to relax and enjoy a really chill vacation, this is your Costa Rica vacation rental.